At ASHA KIRAN we offer different therapies. We have seen a tremendous progress in the children. There are trained therapists who attend to the child on one-to-one basis. Speech Therapy: “Talk to me” is a heart’s cry of every human being. 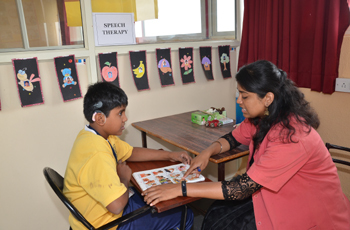 Expressing the basic needs to intense emotions is the objective of Speech Therapy. Finally leading to meaningful communication which is the joy of human race. Children are taught the art of communication through spoken words, signs, written words or pictures or any means with which the child is comfortable. Music Therapy: Music ignites all areas of child development and skills for school readiness: intellectual, social and emotional, motor, language, and overall literacy, apart from helping to strengthen memory skills. It is a well-researched fact that kids who study music from an early age can do better at a range of subjects. Children who play music, learn there are rewards from hard work, practice and discipline. 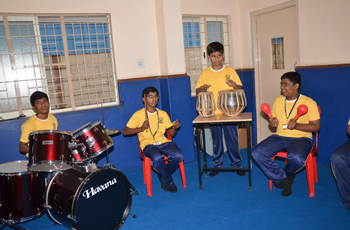 The Asha Kiran choir/therapy groups are a bunch of children who love and enjoy music amidst all the challenges. In the wisdom and grace of God, the beauty in each child is birthed through voice training and equipping them to sing in their own unique way. Behavior therapy: This is an umbrella term for types of therapy that treat mental health disorders. This form of therapy seeks to identify and help change potentially self-destructive or unhealthy behaviors. It functions on the idea that all behaviors are learned and that unhealthy behaviors can be changed. We use play therapy, Cognitive Behavior Therapy, one to one counselling, circle time etc. to change individual behaviours. Physiotherapy/Occupational therapy: These therapists help people affected by injury, illness or disability through movement and exercise, manual therapy, education and advice. They help children to manage pain and prevent disease. Different ADL (activities of daily living) are taught to live a confident and independent lives.